The Week In – A must-read for all the latest news in Bristol and North East Somerset! Click here to view the latest edition. This entry was posted in Uncategorized on January 30, 2018 by Victoria. The 16:00 A4 service from Bristol Airport did not operate today. The 17:30 A4 service from Bath will also not be operating today. This entry was posted in Uncategorized on January 25, 2018 by Connor Flavell. 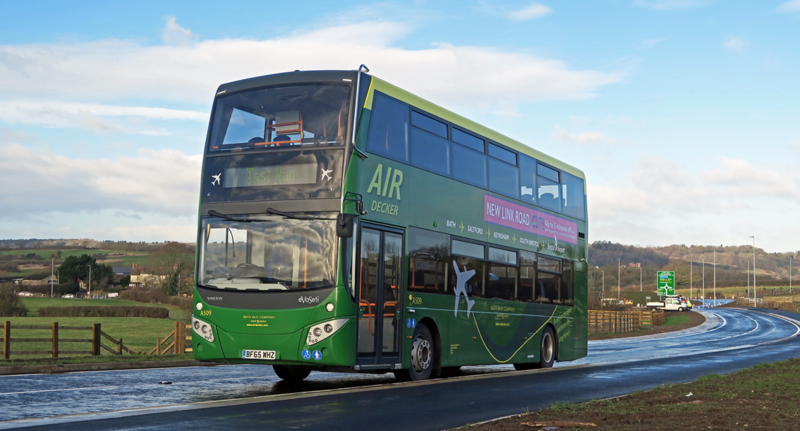 The official handover of two brand new AirDecker buses took place at Burnett, near Keynsham, with Phil Fletcher, Fleet Sales Manager, Volvo Group UK and Bath Bus Company Managing Director, Martin Curtis. Costing almost half-a-million pounds, these two vehicles represent the latest state-of-the-art, low emission diesel engines (producing lower emissions than an average family car) with specially designed luggage racks for secure but easy loading, optional table seating upstairs, USB ports and automatic and live announcements providing journey updates and bus stop details. Built on Volvo B5TL chassis, bodywork was added by MCV while the livery is a revised version of the now familiar AirDecker brand, incorporating Tilling green – the traditional colour for Bath and Bristol buses from the 1940s to the 1970s. Inaugurated less than five years ago, Bath Bus Company’s A4 service to Bristol Airport from Bath via Saltford, Keynsham, Brislington, Knowle, Whitchurch and Hengrove has grown in popularity even faster than Bristol Airport itself – which has handled more passengers every year since 2009 and last year saw over 8 million air passengers pass through its doors. Martin Curtis said, “ The manufactures have worked with us closely to provide a number of modifications and improvements compared with our older buses, many of these suggested by our own drivers. “The standards of service achieved by our AirDecker staff result in constant praise from the travelling public and we are very proud that passenger numbers continue to grow, with 18% more passengers using the service in the period before Christmas, than 2016. This included our busiest day ever during November, with students, business travellers, holiday makers and those flying for family reasons all travelling with us. Over 1,300 people were carried that day; almost 20% of whom booked with us on-line. Whilst most new buses these days are registered where they are built, these vehicles carry local Bristol registration marks. This entry was posted in Uncategorized on January 24, 2018 by Victoria. Hengrove Way between the Hartcliffe Roundabout and Cater Road Roundabout will be closed in both directions from Monday, 15th January 2018 until and including Friday, 19th January 2018 between 20:00 and 06:00 for roadworks. Cater Road Rounabout (Whitchurch Road). This entry was posted in Uncategorized on January 11, 2018 by Connor Flavell. Normal service has resumed on the A4 Air Decker. All journeys will depart as per our timetable. Apologies for any inconveneince caused to earlier journeys that were disrupted. This entry was posted in Uncategorized on January 3, 2018 by Victoria. All other journeys will operate as normal. Apologies for the inconvenience caused. This entry was posted in Uncategorized on January 2, 2018 by Connor Flavell.